Undertaking an MBA in the US doesn’t have to mean sacrificing the international experience boasted by many European schools. 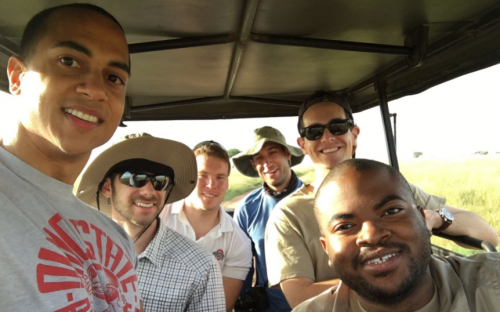 The Full-Time MBA program at The Ohio State University Max M. Fisher College of Business offers a selection of international learning experiences that provides students with opportunities to work in diverse teams around the world and gain valuable experience while also making a social impact. A well-known opportunity among the international learning programs at Fisher is the Global Applied Projects (GAP) program, an experiential learning course that gives students hands-on business experience abroad, and Global Business Expeditions (GBE), high-intensity tours of successful companies abroad during spring break. Recent Fisher MBA graduate Lisa Walsh took part in the GAP program in Brazil in 2016, working with five classmates to design a market entry plan for an Ohio-based manufacturing company. Though Lisa had international experience working in Japan with Teach for America, this was something different. As part of the GAP program, students are required to do all the hands-on market research themselves, and the group’s trip to Brazil was an education for Lisa in how businesses must learn to adapt to unexpected changes in an unfamiliar environment. After her graduation from Fisher College of Business, Lisa will be working for Procter & Gamble in its supply chain program. She hopes to take some of this flexibility and the ability to meet challenges head-on into her new role. However, having previously worked for the nonprofit cancer support center The Gathering Place, Lisa also hopes that the business education she’s gained at Fisher will help her to make a positive social impact later in her career. “Right now, I see myself being in the corporate world, growing my skillset [and] also developing connections I can then use to better a nonprofit,” she says. Fellow recent MBA grad Alan Oommen also participated in the Brazil GAP program, where he sharpened his skillset and received valuable experience abroad. “I picked Brazil because I’m probably never going to have the formal opportunity to work out of South America professionally,” Alan says. “I thought it would be a good experience to understand a new culture and the business there. Besides facilitating international business experiences for its MBAs, Fisher also has a social conscience that extends to social impact projects abroad. Muhammad Shire is a current MBA who has worked with The Ohio State University’s Global Water Institute (GWI) to create a business plan competition for MBA and other graduate students at the University of Dodoma (UDOM) in Tanzania. “GWI has had a long-standing relationship with UDOM, and we felt that creating the business plan in partnership with the university was another way that GWI could help UDOM as an institution, its students and the communities that surround it,” Muhammad explains. The competition aims to link classroom learning at UDOM with a knowledge of unmet business needs in Tanzania, and kicks off at the end of May. Muhammad, for one, is hopeful that the competition will become a yearly project. This global outlook is what Lisa believes makes Fisher so special.